Back in 2001 I submitted a letter to Michael Schacht of ProaFile as possible material for an article. To my surprise, instead of editing it he published it in full. The result is posted below, along with a few pictures. I post it here simply to preserve a record of my early proa experience. 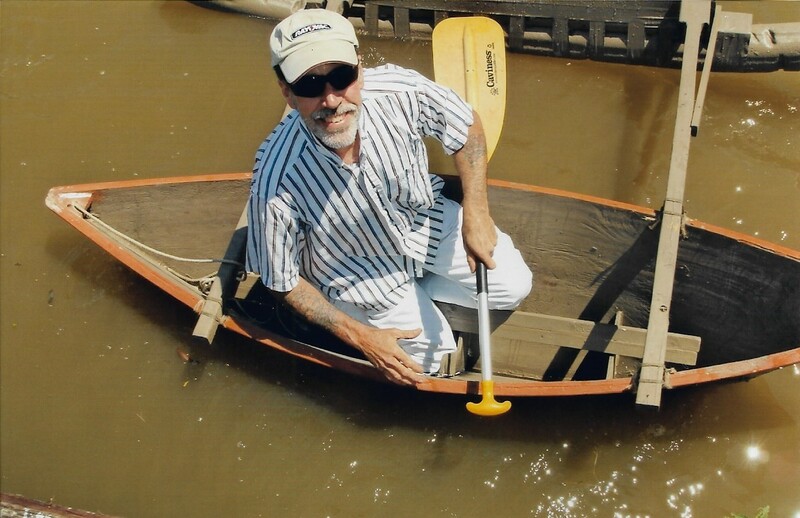 Robert Sky is an outrigger canoe sailor and builder in Louisiana who shares some of his insights and solutions for small proas. 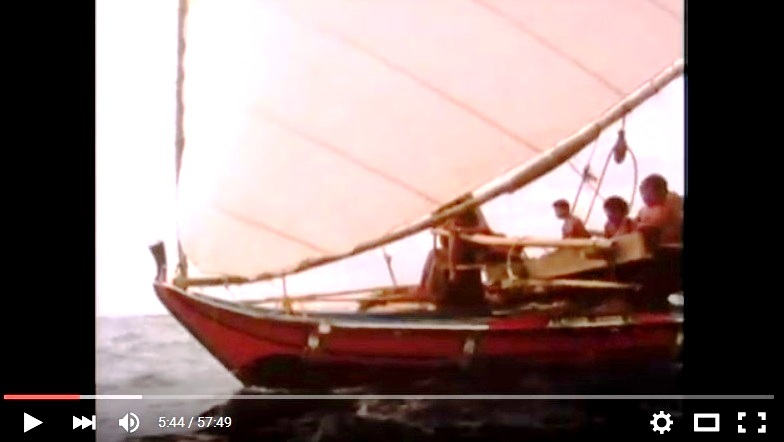 "My first in-depth exposure to the outrigger sailing canoe was through the excellent book: A Song for Satawal, by Kenneth Brower (Andre Deutsch press). Beautifully written, it came along right when I needed a direction, and I was hooked. I’ve had a couple of small trailerable cruisers before but got only a little use out of them. 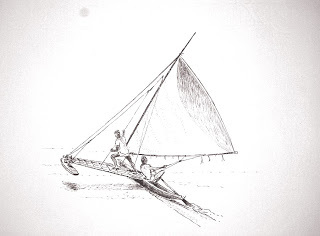 Most of my experience is in really small man — and sail — powered craft; good ground for learning the ways of wind and water. 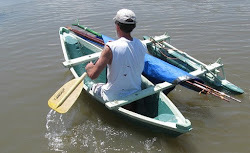 Needing a boat which I could both afford and build myself, I did some R&D using my 14' paddle and sail powered pirogue as "model". I did my first experiments with hastily lashed on outriggers and floats and I was ready. 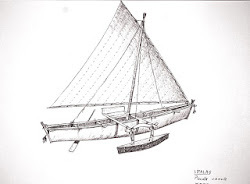 I stuck with the flat bottomed pirogue type I’ve built before — but designed a really deep, narrow and heavily built 16' boat with an ama about 8' outboard. Built of 3/8" plywood, it’s overbuilt (1/4" would have sufficed), but this gave it solidity, draft and waterline length firmly in the water. 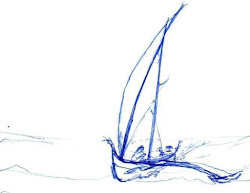 With little flare, she gets good lateral resistance from her nearly flat leeward hullside, and sails to weather creditably well — only rarely needing the leeboard (mostly for light air). 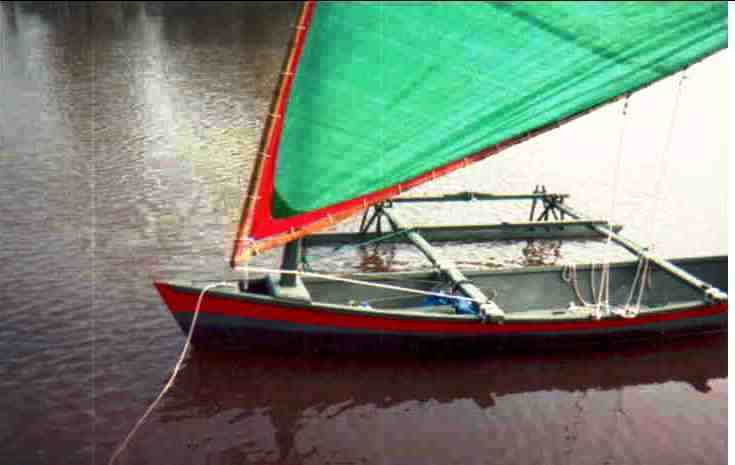 This pirogue design is well suited to South Louisiana coastal waters, with the thin water, mud flats, oyster reefs, and sandy barrier island beaches. 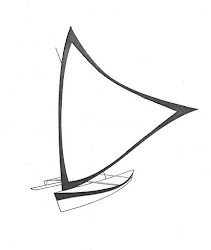 My next hull though, if there is a next, will be a V-hull for superior sailing characteristic without the need for underwater foils. Currently reading with great interest your articles on model testing. 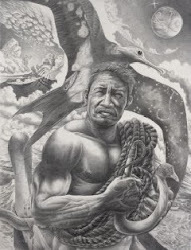 Actually, while not eschewing modern high-tech designs, I simply ignored most of it and turned my attention to what Micronesian natives have done because our situations were similar: we have to work with materials and techniques available to us. 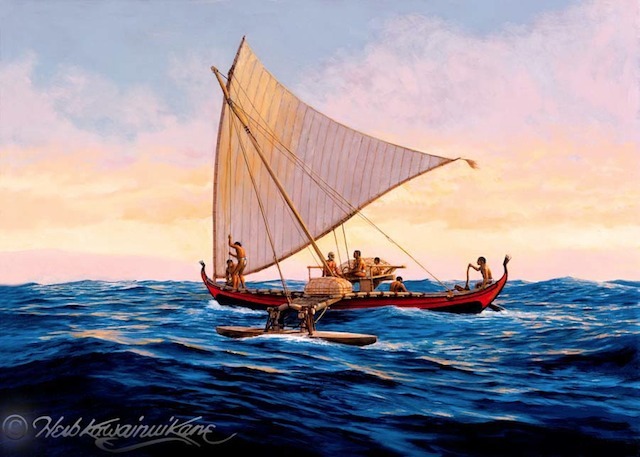 Their wisdom has worked for thousands of years and still works: they’re still voyaging! 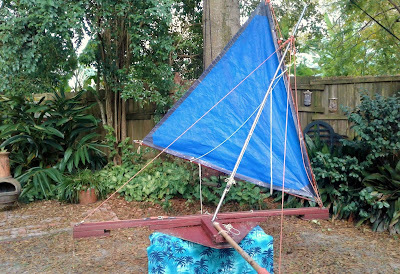 I began with a "tacking" rig: a lateen sail from a short and stumpy freestanding mast. 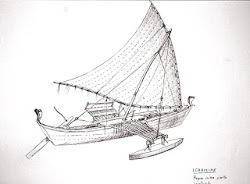 I was already very familiar with its characteristics from using it on my previous small boats, and I could easily build it using bamboo spars and a polytarp sail. The only photos I have of Voyager are with this rig. It performed as expected: really well on the tack with the outrigger to windward and poorly on the other tack. 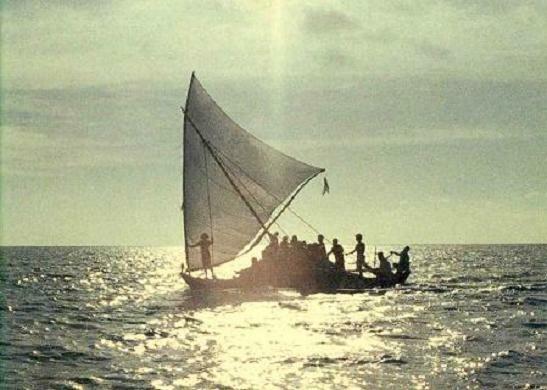 I had built mast steps and collars into each end so that in the event of a really long tack of many miles I could always have the float to windward but for short tacking I was disadvantaged. Sure I could utilize a hiking board for power on the “bad” tack, but I never did like seeing the ama gradually "submarine" as I sheeted in the sail on the bad tack. I just don’t like amas to leeward! Finally - even reluctantly, in view of its idiosyncrasies - I decided to try the Micronesian style rig with its central pivoting mast. 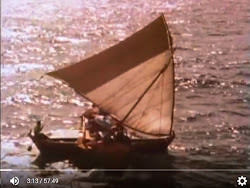 My first few shunts with 90 square feet of sail luffing were daunting, but each time the sail was sheeted home again and I shot off like a rocket, I was 'blown away'! Lots of fine tuning was required and since I elected not to use any kind of mast crutch holding the mast from tilting to windward, I did lose the whole rig overboard to windward quite a few times before I learned not to get backwinded! (Embarrasing and an onerous task to get clear as you may imagine.) I have employed a makeshift mast crutch experimentally but I always feared a windward capsize if I were to be backwinded badly enough. You see my ama is of the heavy solid type and not very bouyant. I utilize only one shroud (3/8" dacron, I believe) and no backstays. 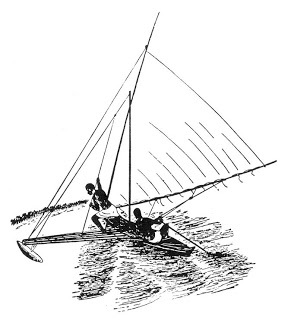 The shroud leads out to a yoke over the ama, through a bored hole and back to a cleat inboard, thus is adjustable to control the angle of the mast athwartships. Backstays didn’t seem necessary, didn’t want the extra rigging and work. Of course, going upscale in size they’d be needed, but its manageable at this size. 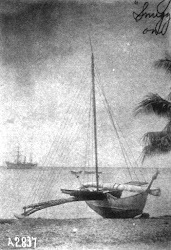 Only on a dead run was something needed because with no rearward pull on the sail it would lift the mast right out of its perch amidships. Of course we rarely run in a outrigger but a simple lanyard tying the mast base to its chock remedied the problem. The mast can be quite slight in scantlings (I use a 2"x2" wrapped with fiberglass and cloth) because it only carries the weight of the sail during shunting and is not functioning in compression or stress while sailing. 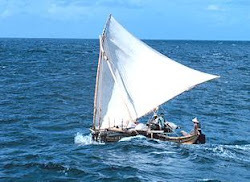 All of the weight and thrust of the sail is taken through the yard down to the chock on the bow of the boat and by the shroud and by the sheet. I find the rig efficient, powerful and forgiving: I became quite relaxed about flying the ama for extended periods and stability seems quite good. In summary: The Micronesian rig has some wonderful traits but sail-handling at sizes much above mine becomes a marginal proposition, especially when single-handed. 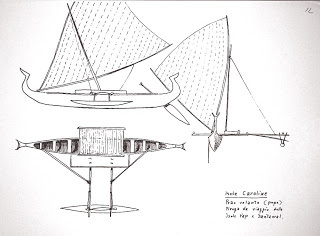 I would like to research and develop the tracked sail idea with a standard Oceanic lateen. 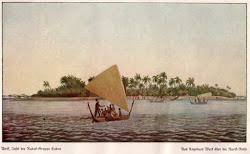 I considered all sorts of flotation schemes in the beginning, for the event of capsize and/or swamping. Never effected any however, couldn't decide on one and stopped worrying about. My boat is recoverable even when "turned-turtle". It comes back upright completely swamped (no air pockets). And floating, of course (hurrah for wood). The boat should be recoverable in this condition: just bail out and go. One problem: The graceful curving sheerline I built into her keeps her gunwale amidships underwater for about 1/3 of her length! (She's heavily built.) This makes her impossible to bail out. (A series of hard shoves forward from her stern might slosh enough water out of her to get the gunwale above water: this could be effected in flatish water but unlikely in any waves). Bottom line: my next boat will have a much flatter or dead flat sheerline. Not as attractive, but it should eliminate that problem. 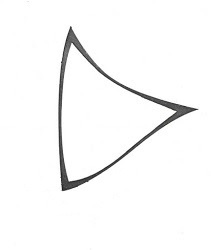 Pass this caveat on to anyone you know considering an open boat without flotation!"